Who is the target audience for the certificate program? The certificate program is based on a job analysis of the role of the community benefit professional. The expectation is that for someone to be competent in community benefit they need to know the information contained in the domains. The content modules are appropriate for every level from novice to expert. Because the program content is self-directed, the community benefit professional can focus on learning those areas where they wish to gain more knowledge and understanding. Experts in the role may need to spend less time on the content than those who are new to community benefit. Am I required to look at every resource and read every article posted in the modules? The Certificate Program uses principles of adult learning. The certificate program was created for learners to us a self-directed approach that allows for discovery on your own. The information included in the certificate program is provided to assist your learning. Therefore, you can explore the content that is new or helpful to you and you are not required to review content that you are already familiar with. Can I exit the module and return at a later date? Yes, the link you have to the certificate program will remain live for six (6 ) months. You may enter and exit the program. [question: does the program keep track of where an applicant left off when he/she exited? Or do we need to tell them to keep track so they can return to where they left off?] If your six month access period expires without completing the certificate, you must reapply and pay the fee to gain access to the certificate program. Will the content of the certificate program be updated? Yes, our plan is to implement a continuous improvement process that includes correcting errors and updating content as new resources or information becomes available. To assist us in updating the content, please send any suggestions and examples of excellent resources to certificateprogram@communitybenefitconnect.org. The certificate program did not answer all my questions about community benefit. The community benefit professional has a broad role that interacts with many internal and external stakeholders. As well, the role is not structured the same, nor does the role have the same responsibilities across all hospitals and hospital systems. The certificate program is not designed to teach the reader everything there is to know about community benefit. Rather, the certificate program outlines the identified competencies for the community benefit professional and provides information, resources and tools to assist the reader to gain a thorough understanding of the role. Hopefully, along the way, we did provide some answers to your questions and offered resources for you to further explore. I have questions about and/or need assistance with the module evaluation options. When I click on the link for the Community Benefit Connect website, I get an error message. 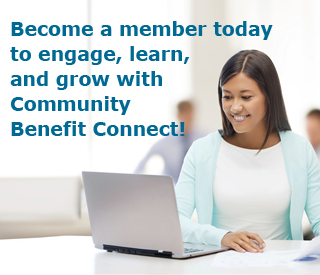 You must be logged onto Community Benefit Connect for the link to work. Please log on to the website www.communitybenefitconnect.org first and then begin the certificate program. How is the review of the assessment project completed? We have engaged a panel of subject matter experts (SMEs) to review the assessments for each domain. Two reviewers are assigned to each submission. Both experts must agree that a project submission fulfills the domain knowledge for the applicant to pass the module. If there is a split decision between the reviewers, a third subject matter expert will break the tie. Feedback on the assessment project will be provided to the applicant. If the assessment project is not approved, the applicant has an opportunity to review the comments of the expert reviewers, make the requested changes and resubmit the project. I found an error or typo in the program, who should I notify? Please send any corrections to certificateprogram@communitybenefitconnect.org. I have a resource to recommend for inclusion in the certificate program. Please send ideas and recommendations to certificateprogram@communitybenefitconnect.org. I cannot open a document posted in the certificate program. There is a broken link in the certificate program.